Tuesday marked the end of the longest presidential campaign season in U.S. history — 21 months. Obama pledged to work across party lines and listen to the 46 percent of voters who chose McCain. “While the Democratic Party has won a great victory tonight, we do so with a measure of humility and determination to heal the divides that have held back our progress,” Obama said. Simon Blackburn: The ancients identify the Seven Deadly Sins as pride, greed, lust, envy, gluttony, anger, and sloth. The entire panoply of human sinfulness was, they believed, traced to one of these root sins and the deadly effects that follow. The Christian church embraced the notion of the Seven Deadly Sins and joined them to the Seven Heavenly Virtues, identified as prudence, temperance, justice, fortitude, faith, hope, and charity. Presumably, temperance was designed to limit lust, but lust appears to have gained the upper hand. Wrath Natural and healthy reaction to unfairness or injustice. Broken friendships, feuds, vendettas, casual violence, unjustified war. Avarice The will to provide oneself and one’s loved ones with the necessities of life, and perhaps some comforts as well. The pursuit of money or material goods to the exclusion of relationships or to the point of unjustly depriving the needy of the necessities of life. Sloth Avoid wasting energy in cases where nothing useful can be accomplished, recharge one’s batteries, smell the roses. Wasting time and energy when critical work needs doing. Pride Keep one’s possessions in presentable condition, maintain an upstanding reputation, be unreproachable in both word and deed. Refuse to admit mistakes, rest on the laurels of long-forgotten achievements, refuse to improve oneself. Lust The continuation of the species. Addictive behavior, neglect of duties, betrayal of loved ones. Or, as the case may be, previously loved ones. Envy Emulating the successes of others. Wasting time and effort coveting the possessions and successes of others, perhaps even attacking others simply to spite them. Gluttony “A man’s gotta eat!! !” Poor health and early death, to say nothing of wasting food, thus resources. Some would argue that the indignation that rights a wrong on the one hand and a vendetta that destroys a community on the other are different in kind, not merely different in scale, and perhaps rightfully so. However, for our purposes, the crucial observation is that both are driven by the same feelings and emotions — in other words, they are both symptoms of the same underlying motivations. The sad fact is that the participants in a vicious and destructive vendetta feel the same sense of moral outrage as does someone standing up to a belligerent bully. The seven deadly sins are clearly extremely powerful motivators, so much so that they are harnessed to drive organizations of all sorts. Interestingly enough, many organizations seem to specialize in one or another of the deadly sins. The choice of sin is extremely important — as we will see, the choice of sin greatly influences the organization’s longevity. 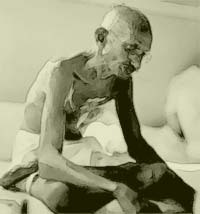 Mohandas Gandhi (1869-1948) was also known as Mohandas Karamchand, the Mahatma, and the Great Soul. His legacy as an Indian nationalist, religious leader and moral revolutionary resonates in social and political reform movements to this day. Most of us are inebriated with excitement and exhaustion. We must recover quickly. Stop glad handing each other long enough to roll up our sleeves, take our vitamins and prepare for a long, heavy haul. We must now set the example we have been bitching about for eight miserable years. We must actually, and carefully, embrace the wounded extremists that angered us so much. We must walk the talk of inclusiveness. We have fought the policy of exclusiveness long enough. We are not exclusive, we are Americans. We respect the diverse and complex components that make the Democratic montage that we are. Diversity is the acceptance of differences. Tolerance is nothing but a cover up. We always hear that someone tolerates someone else. Tolerance means you just keep your mouth shut while anger seethes inside. Understanding and acceptance means you have taken differences for what they are, digested them, and you focus on similarities instead. Few of us really agree with each other. So be it. We no longer need to reduce people’s self-esteem to rubble to reinforce our view. We must lead by example. We must be the good persons we view ourselves as. There are enough common goals to share and join forces on to last several lifetimes.